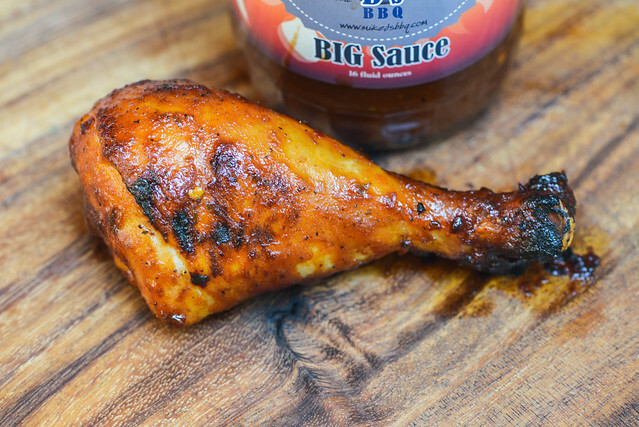 An excellent array of spices, sweetness, tang, and spice make Mike D's Big Sauce a powerhouse out of the jar. I picked up this bottle of Mike D's from the man himself, who was selling it at a craft fair the wife and I attended. 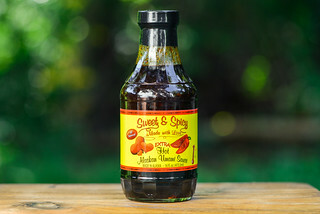 Michael De Los Santos started his Durham, North Carolina-based business in 2014 after realizing he was on to a good thing when his hot barbecue sauce took 3rd place overall in in sauce contest in 2009. 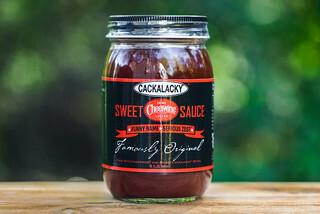 He began production with two sauces, but added a rub to his product line a year later. His business has continued to grow year after year, and he recently went threw a rebranding, making the bottle I reviewed look obsolete compared to the improved graphics adorning his products now. There's a whole lot going on with this sauce on the first whiff. A sweet mixture of tomato and vinegar form a distinct base, but there's a ton of complexity upfront that's a bit difficult to pick apart. There's definitely a mustard pungency along with sharp notes of onion and garlic. Peppers bring an earthy heat to the party, while a combination of Worcestershire and smoke add additional layers to the aroma. 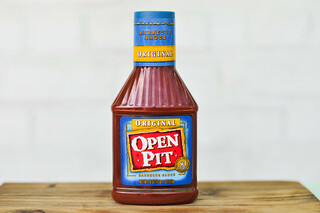 This sauce has a rusty orange hue, smooth texture, and glossy sheen. It's semi-opaque, making it very easy to see the plethora of small orange, white, red, and black spice specs throughout the sauce. It's consistancy is medium-thin and watery, which has the sauce falling in a very fast, steady pour from a suspended spoon. Within seconds most of the sauce has released, and after a few quick final drips, almost no sauce is left clinging to the silverware. The initial taste of this sauce is sweet with a bright tomato flavor. Vinegar quickly comes in and adds a balance to the sugar and a strong tangy profile that persists from then on. As the sauce settles on the tongue, all that complexity experienced in the aroma comes into play. First there's a wave of Worcestershire and mustard that adds depth and pungency. Then the onion, garlic, and earthy peppers work their way in followed by a faint smokiness in the background. As the sauce is on its way out, the peppers let off their heat while the vinegar tartness increases, leaving a more spicy aftertaste with hints of all the flavors that had come before. The sauce coated the chicken leg in a very thin layer that took a few brushings to build up to its final orange-hue. The sauce baked down well over indirect heat, then had no burn off and minimal caramelization over direct heat. The flavor shifted to being primarily sweet, losing a lot of the complexity from out of the jar. The large amount of vinegar meant that the sweetness had a bit of tang to balance it out, but the nuances of the spices, mustard, and Worcestershire diminished. This left the chicken leg tasting a bit understated. 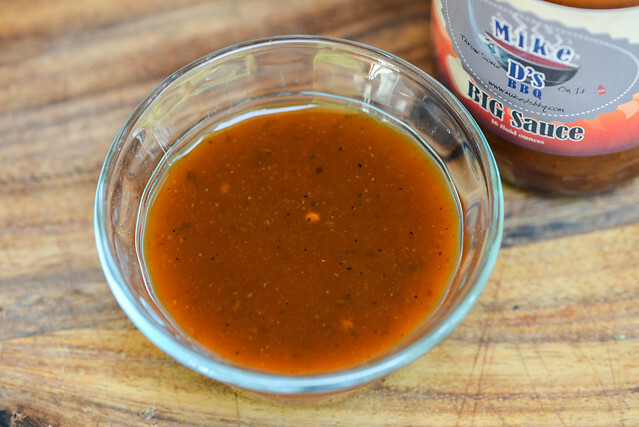 I was a big fan of Mike D's Spicy Sauce, which had a lot of the same complex character traits as the Big Sauce, but with a flavor that worked both on and off the grill. Mike D's Big Sauce was equally delicious out of the jar, with a great savoriness and layers of flavors that were more discernible thanks to a milder, but still present, heat. Unfortunately, that great flavor didn't translate after being grilled and I was left with a sauce whose more subtle taste was best suited for veggies, seafood, and light meats. 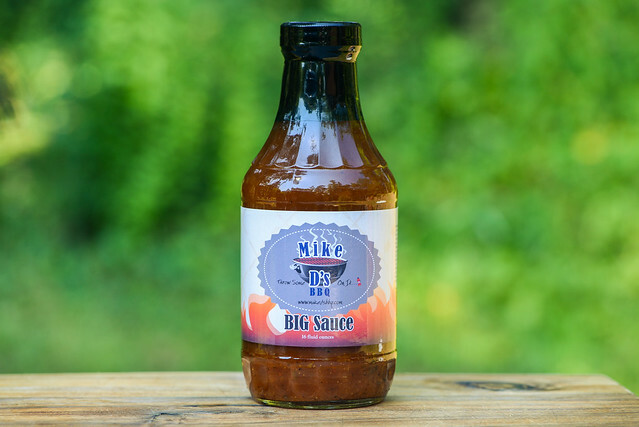 Because of that, I highly recommend Mike D's Big Sauce as a condiment—it was really great on the meatballs Mike was serving at the craft fair—but as a finishing sauce for heavier items like ribs or beef, all of its great flavor may get a bit lost.